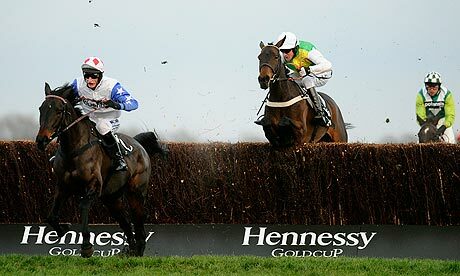 On Saturday the 29th of November the Hennessy Gold Cup takes place at Newbury Racecourse. The Gold Cup was established in 1957 and it was initially hosted by Cheltenham racecourse. The race’s association with Hennessy has continued throughout it’s history, and it’s now British Racings longest serving commercial sponsorship. The purse is a huge £175,000 of which £100,000 goes to the winning horse. There are 35 runners in this years Hennessy Gold Cup and Djakadam is the 4/1 favourite with Bet365 after opening the market at double the price, the French horse is owned by Susannah Ricci and trained by Willie Mullins. Djakadam has participated in three races over the past twelve months and he won the opening two before falling in the JLT Novices Chase at Cheltenham in March, the horse was going strong before falling, he’s a worth favourite in my opinion. Second in the betting is Many Clouds who is priced at 7/1 although he could of been backed at 12/1 just a few weeks ago. Many Clouds trainer Oliver Sherwood believes that his horse has the ability to win the Gold Cup and the horse won earlier this month in Carlisle although this was only a 20 furlong race. Many Clouds is yet to win a race that has been contested over more than 20 furlongs therefore I wouldn’t be in a rush to back it at 7/1. Finally joint second in the betting is Fingal Bay who is also priced at 7/1 with Bet365. There is no doubting that this is a superb horse, he’s raced on three occasions this year and he’s won two races including a brilliant victory at Cheltenham. Philip Hobbs is the trainer of Fingal Bay and he’s hopeful of landing another winner to his long list on Saturday. Back in 2001 Philip trained What’s Up Boy to win this event and I believe Fingal Bay has every chance of winning this years race. Fignal Bay’s trainer Hobbs has had a great start to the season, his horses have won the Old Roan Chase, the Charlie Hall and he had SIX winners at the Paddy Power meeting at Cheltenham just a few weeks ago. Rocky Creek – Rocky Creek is a horse that has impressed me over the last few years and he impressed many last year when it finished second in the Hennessy Gold Cup. Admittedly he is carrying 5lb more weight this year but trainer Paul Nicholls believes the horse has what it takes to win. Nicholl has won the Gold Cup twice as a jockey and three times as a trainer therefore he certainly knows what it takes to win this prestigious event. Earlier this month Rocky Creek raced for the first time this season and finished second to Road To Riches which suggests he’s in pretty good shape. The Druids Nephew – Irish horse The Druid Nephew features in the Hennessy Gold Cup for the first time and I think seven year old is a great price at 14/1. Just a couple of weeks ago he performed really well at Cheltenham finishing in 2nd place in soft conditions. This performance was really promising and it suggests he is capable of competing on Saturday. Under a new trainer N.P.Mulholland this season The Druid Nephew has really stepped up a level, I’m more than happy to back him at 14/1.